That’s what fans were told ad nauseam when the Toronto Raptors acquired the former NBA Finals MVP last summer, and so far he has delivered. The Raptors lead the overall NBA standings with a 31-12 record, and unlike last year, there’s reason to believe they can translate their success into the postseason. While Vince Carter was welcomed back to town for possibly the last time, it was the Raptors’ current superstar that stole the show. Leonard scored 31 points, going 11-for-18, with four rebounds, six assists, and six steals in 35 minutes of playing time, but all you needed to see was his performance in the final 30 seconds to understand why Raptors fans are chanting “MVP” for him this season. The two-time NBA Defensive Player of the Year won the game for the Raptors without scoring a single point in the final seconds. With Atlanta holding possession and the Raptors trailing 101-100, DeAndre’ Bembry appeared like he may blow by Leonard for a clear path to the basket. Kawhi stole the ball off Bembry, leading to a beautiful passing play and an easy dunk for Serge Ibaka. With the Raptors now holding a one-point lead, the Hawks got a chance to win the game on the final possession. They put the ball in Trae Young’s hands, despite the fact Kawhi was guarding him. Kawhi kept up with the speedy point guard before blocking Young’s layup. Three passes later and OG Anunoby had an easy dunk to seal the 104-101 win. 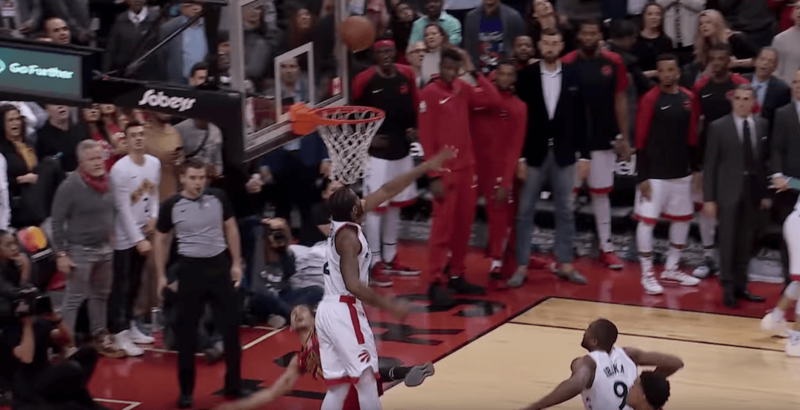 These are the types of plays that have elevated the Raptors from pretenders to serious contenders in the NBA this season. With LeBron James leaving for a middling LA Lakers team and the Golden State Warriors looking human more than usual this season, there’s a conceivable path to winning an NBA title this season. It won’t be easy, but it certainly doesn’t seem as impossible as it did a few months ago.